The Make Me Local team are delighted to announce that we have been named Best SME at the Bromley Business Awards, as well as being Highly Commended for the Employer of the Year award. 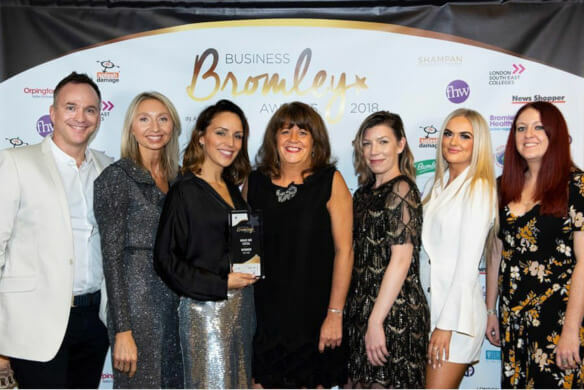 We are so pleased that our growth and success have been officially recognised, as we have become a highly successful, well-established SME in the Bromley business community. What criteria did we meet? As ever, the competition this year was tough. This was especially true of the Best SME award category, which was open to any company in the Bromley borough with a turnover of up to £15 million. The award organisers placed great emphasis on the role of SMEs within the community and their contribution towards the economy, wanting to see a company that could start up, grow, thrive and move into a position of longer-term sustainability. We are so proud that the judges had such confidence in our business and our brand-new award has taken pride of place in the office. The Bromley Business Awards ceremony was a great opportunity to celebrate the borough we live in, work in and love. Local means a lot to us; we are proud to be an SME based in Bromley, as well as helping others to capitalise on their own locations and find their ideal customers. We enjoyed celebrating the borough’s business achievements with all those involved. Being named Best SME marks a new chapter in the Make Me Local story. We were already looking forward to 2019, and now we are even more excited to join forces with other local businesses and help them to succeed online. We have plenty of projects lined up in the New Year, including one of our biggest to date, and we are offering a brand-new service to help our clients manage their reputation online. We also have exciting plans for our own content offering, devising strategies to help businesses have a better understanding of the online world. You can keep up to date with Make Me Local on Instagram, follow us on Twitter, or like us on Facebook. Once again, well done to everyone who was involved in the awards in any way, shape or form, and thank you for making it such a success. We will look forward to seeing you all again next year to celebrate Bromley’s business achievements.